Cropping is one of the ideal ways to improve the general aspect and impact of an image. It can help you focus it better on a main subject, get an enhanced composition in a photograph, and delete distracting or unwanted details. But when you deal with a large number of images, cropping can become tedious and tiring. So in case you want to avoid doing repetitive sets of operations when it comes to editing images, try reaConverter's batch cropping tool. It saves a lot of time and effort, and it's really easy to use. Load one or more images, or add an entire folder if this is case. Go to the Edit images tab, and select the Add action button. Here you can choose Crop directly from the shortlist, or go to Alteration and Orientation and select it from there. Then enter the details of the cropping process. You have the possibility to crop from the center of the image, or from its edge, by entering the desired parameters. If you are unsure about what to enter here, you can always check the results in real time by ticking the Preview button. 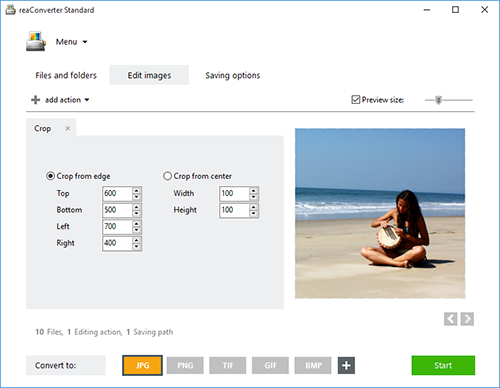 Go go the Saving options tab and decide where you want to save your newly cropped images. You can save them in a local folder or directly in your Dropbox or Google Drive. 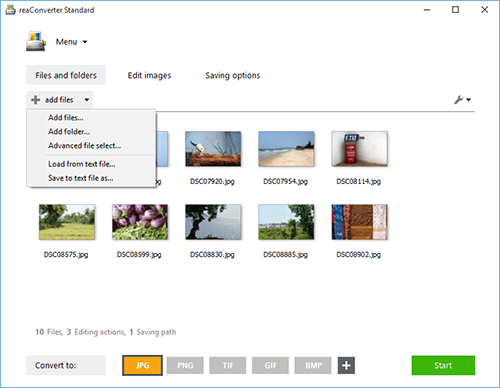 Last but not least, pick a format for the new files by clicking on one of the buttons conveniently placed at the bottom of the window. 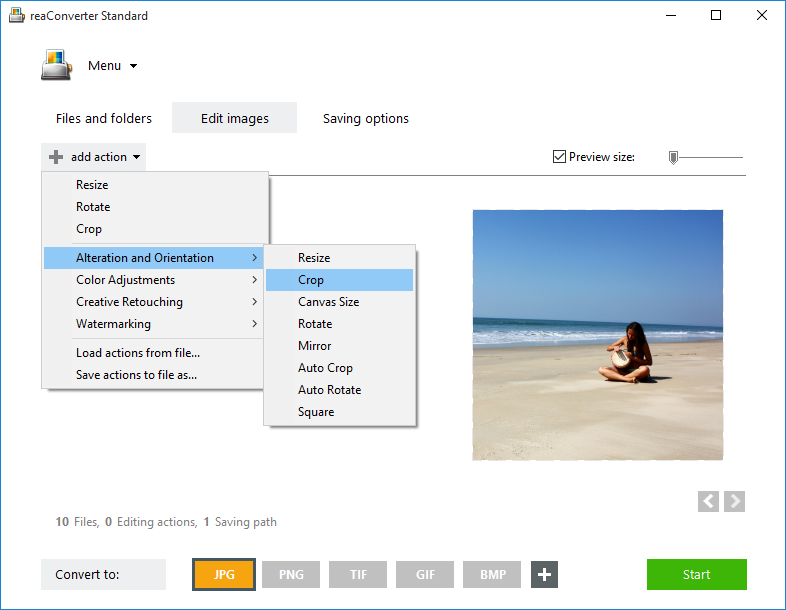 You can choose to keep the initial format or convert your images to one of the 40+ available image extensions. Finally, press the Start button, check the conversion log and quickly enjoy your newly cropped files! Command-line cropping tool is an advanced feature meant for professional use, and is available in Pro edition only.